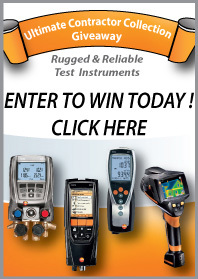 testo Emissions: Enter Testo's Ultimate Contractor Giveaway! Enter Testo's Ultimate Contractor Giveaway! Employees of Testo along with distribution and wholesale partners and any family members are not eligible to participate in the giveaway.